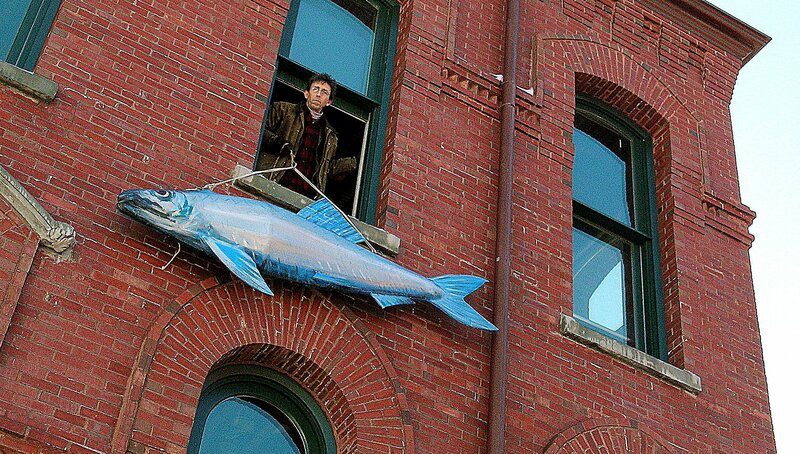 EASTPORT — This little town on the edge of Maine lowers an 8-foot sardine out a third-floor window to ring in the New Year. Hundreds gather to watch. And then kiss it. It’s the Great Sardine & Maple Leaf Drop. The tradition began in 2005. “It was just kind of a crazy idea at the time,” said Jude Valentine, director of programs at the Tides Institute & Museum of Art, a renovated bank building that has become New Year’s Eve headquarters. An artist in town had floated the suggestion, she said. New York could have its fancy Waterford Crystal ball in Times Square. 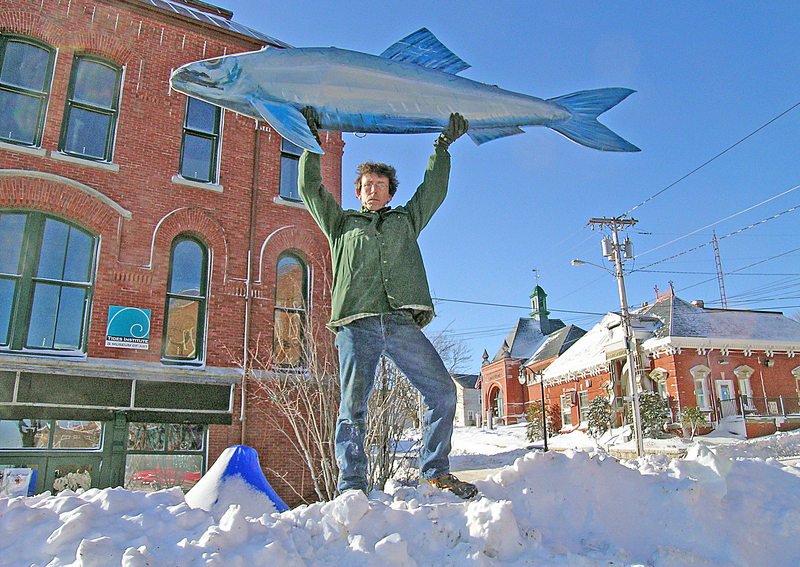 Eastport, home of the first sardine cannery in the U.S., could have its fish. Come midnight that first year, capping a night of celebration, townspeople dropped a papier-mache sardine out the window. The reviews were good, but that initial effort was bulky and a little hard to handle. Enter Bill Schaefer. Teacher. Artist. He stretched canvas over an 8-foot wooden frame and painted it in acrylics. The sculpture weighs about 30 pounds. “I said, ‘OK, here’s your fish.’ Then I was asked to come up with an idea of how to drop it,” Schaefer said. He designed special rigging and has each year since helped guide it to the ground so the Great Sardine gently bellies out at midnight on the dot. Schaefer also created the 4-foot red plywood maple leaf that’s dropped an hour earlier at 11 p.m. (midnight Atlantic time). “There’s not a whole lot going on, anyway, so it sort of works out I haven’t had any more lucrative offers for New Year’s,” said Schaefer, of East Machias. Eastport has rallied around its unconventional drop, with special events for children early in the night. Downtown businesses and eateries, including The Pickled Herring and Happy Crab, stay open late. Three hundred to 400 people turn out to watch, Valentine said, traveling from California, Toronto and all over Maine. 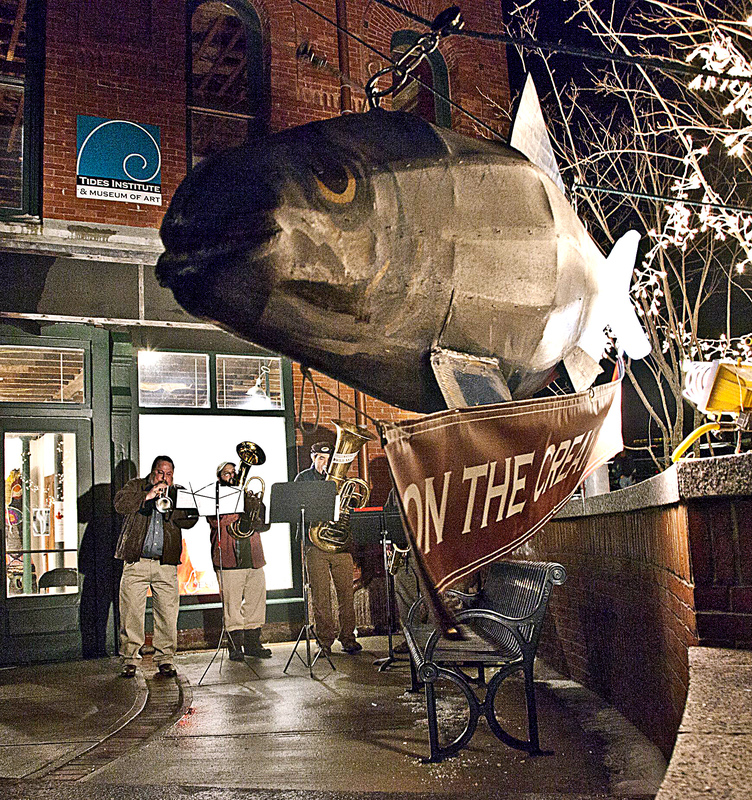 The visitor chosen at random last year to help lower the Great Sardine hailed from Ohio. “He drove to Eastport for this event,” Schaefer said. Two years ago, a CNN reporter and photographer blogged the event from the third floor of the Tides building. He isn’t sure who puckered up first and is a bit puzzled by the practice. One visitor told him, “‘Oh, yeah, it’s good luck to kiss the fish.’ Wow, where did that come from?” he said. It’s not too early to start making plans.